Following the Prime Minister’s Office (PMO) “decision” to withdraw a circular issued by the Information & Broadcasting (I&B) Ministry seeking suspension or cancellation of media accreditation issued to journalists if found guilty of fake news, the Government of India is all set to work out new ways to “regulate” media. This time, however, the focus is on digital media. 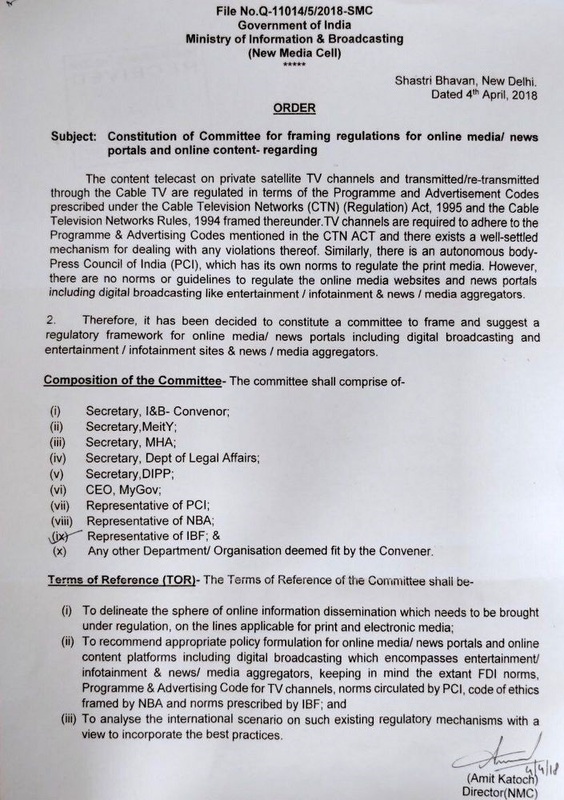 The order, dated April 4, a day after the PMO acted against the I&B circular, says that the “content telecast on private satellite TV channels and transmitted/re-transmitted through the Cable TV are regulated” under the Programme and Advertisement Codes prescribed under the Cable Television Networks (CTN) (Regulation) Act, 1995 and the Cable Television Networks Rules, 1994. To be chaired by secretary, l&B as convener, other members on the committee include secretaries of the Ministry of Ministry of Electronics and Information Technology, Ministry of Home Affairs, Department of Legal Affairs, Department of Industrial Policy and Promotion (DIPP); CEO of the MyGov programme, a citizen engagement platform of the Government of India; and representatives of the Press Council of India (PCI) the National Board of Accreditation (NBA), and Indian Broadcasting Foundation (IBF). The order gives the I&B Ministry secretary the power to include as members “any other Department/ organisation deemed fit”. The order’s Terms of Reference (TOR) are three-fold. First of all, it seeks to “delineate the sphere of online information dissemination which needs to be brought under regulation, on the lines applicable for print and electronic media”. 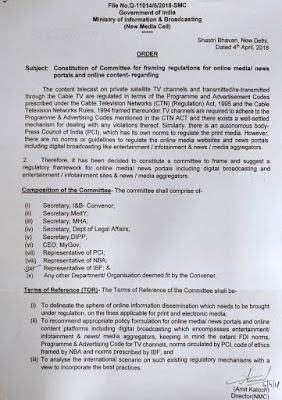 Secondly, it would “recommend appropriate policy formulation for online media/ news portals and online content platforms, including digital broadcasting, which encompasses entertainment/ infotainment & news/ media aggregators, keeping in mind the extant FDI norms, Programme & Advertising Code for TV channels, norms circulated by PCI, code of ethics framed by NBA and norms prescribed by IBF. Keen media analysts say, the order suggests that under scanner would be not just online portals, which have acquired a strong anti-establishment stance, but even online social media sites, including Facebook, Twitter, WhatsApp, Youtube, and blogging platforms. Meanwhile, a media report says that the Press Information Bureau, the Government of India’s nodal body for official communication, is working on a new proposal to track the movement of journalists at government buildings and offices through radio-frequency identification (RFID) cards. 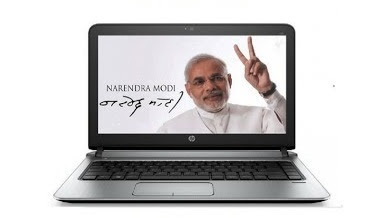 While RFID cards are voluntarily given to journalists in Gujarat, considered a “model” state by Prime Minister Narendra Modi all his moves, there are indications that these would replace the current accreditation cards issued by PIB to those covering the Government of India. According to the report, PIB wrote to the Union home ministry in January asking if the accreditation cards it issues to journalists could be replaced with RFID cards and the home ministry is said to be “considering the proposal”. This govt is on suicide path.